Maybe some of the most interesting buildings in the world are located in your city or country and you don’t even know about them yet. Or you might be travelling soon in some of these locations and miss out on them. Whichever the case, if you have the opportunity, keep in mind to visit these amazing pieces of creative architecture. The Marqués de Riscal Hotel, situated in Elciego, Spain, is the product of the imagination of Frank Gehry, a Canadian-born American architect. Also known as the Marqués de Riscal Vineyard Hotel, the place is a true piece of art both on the outside and the inside, including tilted walls, cathedral-height ceilings and zigzag windows. The hotel is located in The City of Wine, where the winemaking tradition and the beautiful landscape complement each other. The Marqués de Riscal Hotel accommodates guests in 43 rooms and suites. Located on Paholyothin Road and Ratchadaphisek Road in Bangkok, Thailand, The Elephant Building’s name is quite self-explanatory. It is an elephant-shaped building resulted from a collaboration between Dr. Arun Chaisaree and architect Ong-ard Satrabhandhu. The building might be funny looking, but it is not considered to be one of the most beautiful that exists since it was awarded the 4th place in the “20 World’s Ugliest Skyscrapers” list made by CNNGo. The building spans on 32 floors including offices, residential and luxurious residential suites, a recreation ground with swimming pools and gardens, a post office, a bank, a shopping area and a parking garage. One of the most creative buildings in the world is the Kansas City Library, located in Kansas City, Missouri, USA. What better shape than that of a bookshelf could a public library building have? The structure’s front displays 22 book spines reflecting a wide variety of reading interests. In fact, the titles showcased were suggested by the Kansas City readers then selected by The Kansas City Public Library Board of Trustees. Some of the titles displayed on the library’s building are bestsellers from different literary genres: “Winnie the Pooh” by A. A. Milne, “Fahrenheit 451” by Ray Bradbury, “One Hundred Years of Solitude” by Gabriel Garcia Marquez, “Catch-22” by Joseph Heller, “The Lord of the Rings” by J. R. R. Tolkien, “Romeo and Juliet” by William Shakespeare etc. The Kansas City Library was designed by the architect Brian M. Finn. The Basket Building, located in Ohio, USA, was the idea of Dave Longaberger, founder of The Longaberger Company, an American manufacturer and distributor of handcrafted maple wood baskets and other home and lifestyle products. The giant basket was designed to house the entire corporate offices of the company. The Longaberger Company’s headquarters is a seven-story, 180,000-square-foot building which takes the shape of the company’s biggest seller, the “Medium Market Basket”. The novelty architecture characteristics of this amazing building continue on the inside, with marble floors, a grand staircase and a player piano situated in the building’s atrium. This home shaped like a sea shell was created by architect Javier Senosiain, who likes to call it a piece of “Bio-Architecture” inspired by the works of famous architects such as Antoni Gaudi or Frank Lloyd Wright. The building houses a young couple with two children and it’s situated in Mexico City, Mexico. The structure was meant to make its inhabitants experiment what it is like to live inside a snail. The multi-colored glass creates an amazing mosaic in the living area and real trees grow around a curved sofa! Young Lithuanian architect Rimas Adomaitis brought a highly unusual building to the suburbs of Kaunas. The structure’s exterior is made of 4,500 pieces of glass that create the image of a giant Lithuanian banknote (a 1926 LTL 1,000 banknote), just like an oversized puzzle. Appropriately, Office Center 1000, as the building is also known, houses the working offices of different Lithuanian banks. The glass that makes up the façade was shipped from the Netherlands and the chief architect of the project claims that it can stand any type of weather. The images on the pieces of glass were created by using a “screenprinting” technique provided by the Glass Printing International, a company managed by Dutch artist Rob Borgmann. The Crooked House (or Krzywy Domek as it is better known in its home town Sopot, Poland) accommodates both individual and business customers. In creating this physics-law-defying building, the architects Mrs and Mr Szotyński used drawings by Jan Marcin Szancer, Polish illustrator of over 200 books and children’s magazines, scenographer and professor at the Academy of Fine Arts in Warsaw. The building was meant to be a symbol of the modern world combining culture, art, innovative technology and business and it certainly succeeded in doing so. Besides housing the offices of companies from various industries (finance, IT, health, media), the Crooked House attracts culture and entertainment lovers as well by hosting important festivals, concerts, exhibitions, press conferences etc. Krzywy Domek is a magical and unique building to visit when in Sopot, Poland. The lovers of avant-garde architecture can either spend some nights as guests at the Galéria Spirit Hotel in Bratislava, Slovakia or just hang out in its café area for a few hours. This brightly colored building, both on the outside and the inside, is supposed to have positive effects on the human subconscious creating a relaxing and fun atmosphere. The place also offers professional consultancy in the field of healthy nutrition. Made of curved sheets of metal, The Experience Music Project Museum is an impressive building located in Seattle, Washington, USA. It was built out of a collaboration between Frank Gehry’s design and Zahner’s production of the curvilinear structures. The Museum itself was founded by Microsoft co-founder Paul Allen in 2000 and houses many cultural exhibitions and interactive activity stations. Not only the appearance of this building is unusual, but the activities visitors can experiment in the museum are special as well. For example, you can explore hands-on the tools of rock ‘n’ roll through instruments, and perform music before a virtual audience. The name of this original piece of new-baroque architecture is inspired by its appearance resembling two dancers. In fact, for a while, the building was also known as Fred and Ginger, after the famous dancers Fred Astair and Ginger Rogers, but its architect, Frank Gehry, decided it was best “not to import American Hollywood kitsch to Prague”, Czech Republic. The construction is made from 99 concrete panels, each with a different shape and dimension. It became such an iconic element of Prague’s landscape that the Czech National Bank issued in 2005 a gold coin with the motif of the Dancing House, as the final coin of the series “10 Centuries of Architecture.” The structure serves as an office building and it’s not open for the general public, but there is a restaurant on the 7th floor that you can visit and meanwhile enjoy the beautiful panorama. The House in the Clouds offers self catering holiday accommodation in Thorpeness, Suffolk, UK. Its weird tower-like shape is a consequence of the building’s original purpose: storage for a water supply for Thorpeness village. The water tank had a capacity of over 50,000 gallons and was capable of pumping 1,800 gallons of water an hour from a well. After being remodeled for holiday accommodation, the House in the Clouds is 70 feet high, has 5 bedrooms, 3 bathrooms and the room at the top, which offers a splendid view. The building has 68 stairs but they are easy to climb since the staircase provides a small landing in between each floor. Situated near Oegstgeest (between Amsterdam and Hague) in the Netherlands, The Corpus Museum is the first human biology interactive museum. The building’s outside is shaped like the profile of a sitting human body and it becomes even more interesting on the inside with a fiberglass structure meant to recreate the insides of the real human body. This way, visitors learn about the human biology through both educational and entertaining architectural elements. The unique experience is enhanced by modern technology that provides 3D effects and sounds to explain all aspects of a functional human body. This “amusement park for the mind” was built as a place of edutainment in that it provides a unique experience of learning about different natural events or scientific discoveries and inventions. It was designed by architect Michael Ussery to look like it was picked up by severe weather and dropped elsewhere, on an existing building. Wonderworks has amusement parks in different locations in the US, such as Pigeon Forte, Tennessee; Orlando, Florida; Myrtle Beach, South Carolina etc. The available exhibits and activities include experiencing a 5.3 Richter scale earthquake, creating 3D images of your body on a gigantic pin wall made of 40,000 plastic pins, playing a giant piano by jumping from key to key, experience zero gravity etc. In Sofia, Bulgaria, there is a huge building resembling a snail. Because of its multicolored façade, the house looks as if taken out of a children’s cartoon. It even seams to crawl along the lane and has some detailed elements added on the roof: a ladybug and a butterfly. The Snail House was designed by local architect Simeon Simeonov and it took 10 years to complete. The 5 story building has no edges, corners or straight walls and it is built entirely out of environmentally friendly materials. 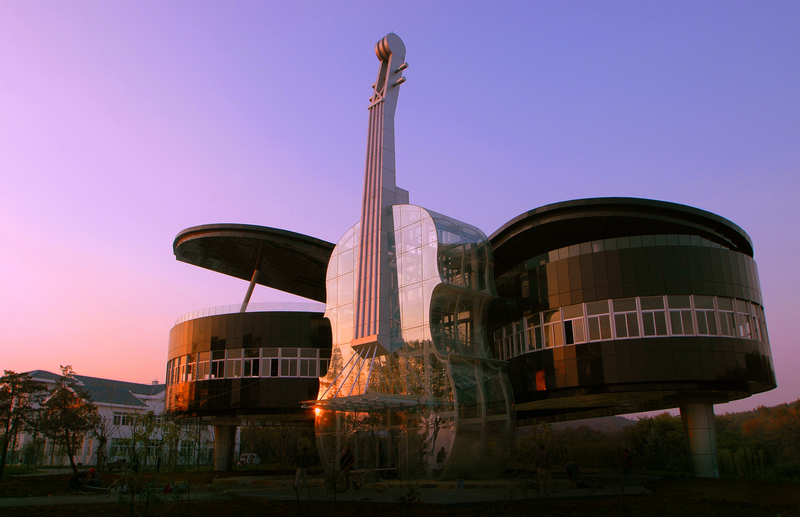 The Piano House, situated in Anhui, China, actually consists of a piano and a violin shaped building. The transparent violin provides the entrance to the main building and access to its different floors by use of escalators or stairs. The musical themed exterior has nothing to do though with the purpose of the building, as it houses showrooms for exhibiting the various city plans and development projects of the area. The Piano House was built in 2007 based on the design of architectural students at Hefei University of Technology. At night, the building remains in the darkness but the contours of the piano and violin are elegantly lit creating a special atmosphere for the passerby. The Bolwoningen (Dutch for “sphere houses”) consist of a set of 50 alien looking ball shaped houses situated in Den Bosch, Netherlands. Dutch artist and sculptor Dries Kreijkamp designed these futuristic buildings in the late 1970s and they were built in 1984. The architect was fascinated by the sphere form in general and he argued that this shape was the best to use in buildings because “the globe combines the biggest possible volume with the smallest possible surface area, so you need minimum material for it. It’s space saving, very ecological and nearly maintenance-free.” Even if each sphere house offers only 55 square meters of space, the interior includes open platforms and interconnected functional areas making the place seem more roomy. The Haines Shoe House, located in Hallam, Pennsylvania, USA, is a 25 feet tall replica of a work boot. It was built by shoe salesman Mahlon Haines in 1948 in order to advertise his company’s products. Haines himself lived in the building for a while but eventually decided to rent out the five story house to couples. The renters were served by a butler and a maid and received free pairs of shoes when they left. Nowadays, the Shoe House is open for public tours. Visitors can admire the living room located in the toe, the kitchen situated in the shoe’s heel or the two bedrooms located in the ankle. The shoe house is complemented by a shoe shaped dog house situated nearby. The most obvious element of weirdness regarding the Dalí Theatre and Museum is the fact that the façade is topped by a series of giant eggs. Other historical particularities make it special too. The building is situated in Salvador Dalí’s home town in Figueras, Catalonia, Spain and, according to Dalí himself, the construction is meant to be “a labyrinth, a great surrealist object”. As the name suggests, the building is both a theatre and a museum hosting many of the artist’s paintings, sculptures, 3D collages and other results of his imagination. Also, Dalí’s body is buried below the theatre stage.